Sarah G. Bagley became the first female telegraph operator in 1846. A women’s rights advocate, she also worked to make millwork safer for women. Lucy B. Hobbs became the first woman dentist when she graduated from the Ohio College of Dental Surgery in Cincinnati, Ohio, in 1866. She practiced dentistry for over 20 years. She then turned her attention to politics and women’s rights. Washington Monument was dedicated in 1885. The first plans for the Washington Monument were quite elaborate, including a statue of Washington in a chariot. Ultimately the plans were simplified to a plain obelisk. Construction began in 1848, but the Civil War and lack of funds stopped work. After the War, construction began again. Children can learn more at: http://www.nps.gov/wamo/index.htm. 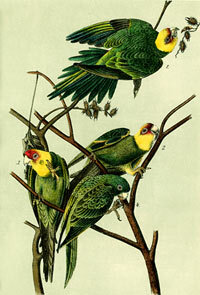 Last green and yellow Carolina parakeet died in 1918. The only parrot species living in eastern United States, the birds could be found from Wisconsin to the Gulf of Mexico. The birds lived in forests along rivers. Then, for a number of reasons, the number of Carolina parakeets plummeted. The last Carolina parakeet died in the Cincinnati Zoo. Polaroid camera was patented in 1947 in New York, New York, by Edwin H. Land. Older children can read an interesting article about Land and the Polaroid at: Polaroid Camera. Jim Aylesworth (born Jacksonville, Florida, 1943) writes books for children. His books include The Mitten and The Bad Dream. His book My Grandfather’s Coat received the 2015 Sydney Taylor Award (Younger Readers’ Category). Children can visit his website at: Jim Aylesworth. Patricia Hermes (born Brooklyn, New York, 1936) has written at least 20 books for children. Her works include a number of books in the My America Series, including Our Strange New Land and A Perfect Place. Ruthanne Lum McCunn (born San Francisco, 1946) writes books for children. Her works include Thousand Pieces of Gold and God of Luck. Children can visit her website at: http://www.mccunn.com/. Virginia Driving Hawk Sneve (born Rosebud Indian Reservation, South Dakota, 1936) writes children’s books regarding Native Americans. Her works include Lana’s Lakota Moons and When Thunders Spoke.